Carl Dyer’s Original Moccasins can be resoled an indefinite number of times provided the leather is maintained in good condition. We sure would appreciate it if you would remove excess mud and cow manure from moccasins before sending them in for a resole. While we love nature and animals we don’t necessarily want to put our hands in it! 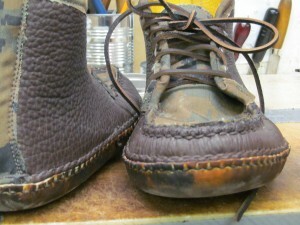 We can resole moccasins made by others only if they are of similar leather thickness and construction. Additional charges may apply.